Kids Magento Template. Toys Magento Template. The Kids Magento Template is the perfect theme for a shop selling Baby Products in Baby and Toddler Toys, Strollers, Car Seats and Accessories, Health and Baby Care, Baby Stationery, Gifts. With Our Custom Menu extension, you have flexible menu configuration functionality! This replaces the standard Magento menu with a multi-column drop-down menu system. Additional modules/features: customizable catalog, highlited categories block, chat support block, newsletter sign-up, most popular, home page banner, home page products, customer service block, social networks, testimonials, payments and SEO block. Every browser can handle this Magento template (there are a couple of caveats regarding IE6). Template is optimized for fast loading, search engines, and usability. The homepage is fully HTML editable. Displays products on the store home page, customizable through the back end. 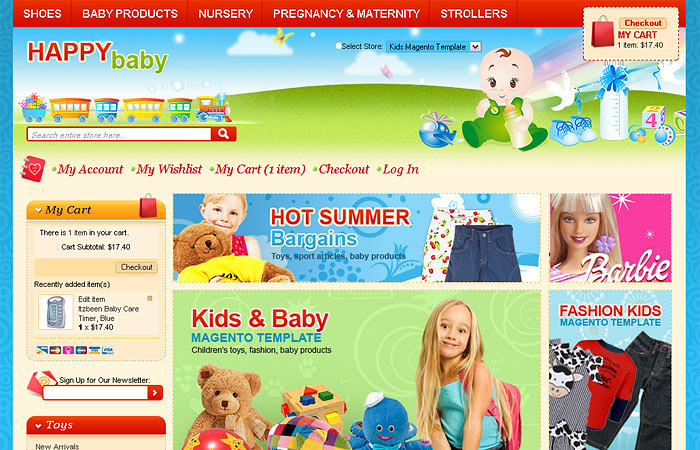 Easy customized Magento Theme for Kids and Baby store. Custom blocks: main products categories, most popular products, customer service info, testimonial, seo text, payments, social links.